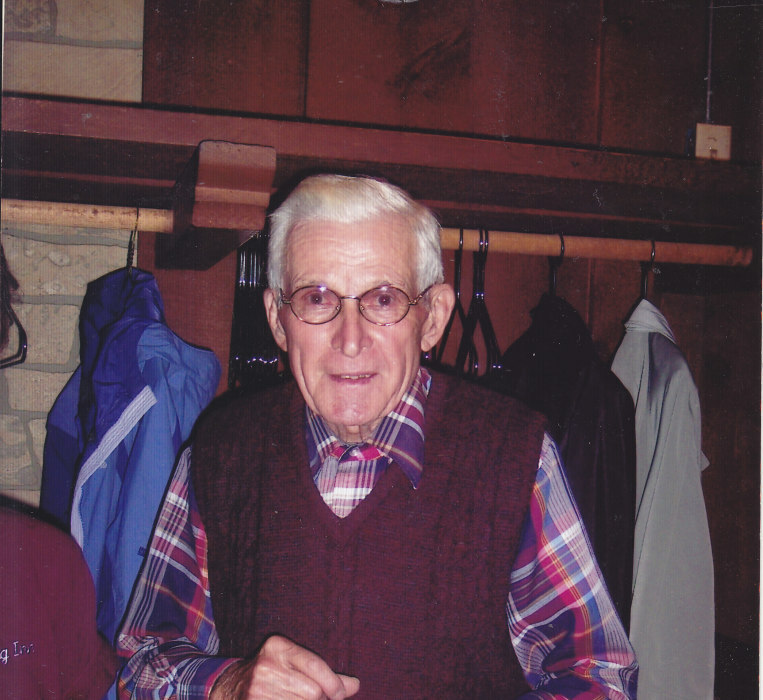 Richard E. Oliver, age 97, of La Crosse and formerly of Genoa, passed away on October 6th, 2018 at the home of his daughter, Lois, in La Crosse. He was born on July 24th, 1921 in Genoa Township to Herman and Alma (Bobst) Oliver. He was baptized and confirmed at Main Street Lutheran Church, now known as Good Shepherd Lutheran Church by Reverend Kleven. He married Ruth Marie Doerr on June 3rd, 1942 at English Lutheran Church in La Crosse. Ruth passed away on March 26th, 1992. He lived all of his life in various locations in Vernon County and La Crosse Wisconsin. In 1958 he returned to Bad Axe Valley where he was born. He continued to live there until 7 years ago when he came to make his home in La Crosse with his daughter, Lois. He returned home weekly to mow the lawn and raise a garden through the summer on 2017. A big believer in the Farmer’s Almanac, he was full of weather lore, sage wisdom, and weather prognostications that tickled his grandchildren. Richard farmed in Vernon County for many years, worked in La Crosse at the Auto-Lite, the La Crosse Rubber Mills, and American Motors in Kenosha. He also was a bartender at Buckhorn Tavern in La Crosse, as well as worked for Klienpell Lumber Yard in De Soto. In later years he was a self-employed carpenter working for many families in the area. Vacation meant “Working at a different job” like helping a relative or neighbor harvest tobacco. On very rare occasions, there might be a day of fishing on the Mississippi River. He embodied the term “jack of all trades”. He never really retired as he was a handyman to family and friends well into his 90’s. Even in his failing health, he continued to give to others by making hats on his loom. His main goal in life was to provide for his family and help as many people as he could. He leaves a wonderful legacy for his family of an unmatched work ethic, honesty, and kindness. He is survived by his daughters Ann Louise (Albert) Wolfe of Genoa, and Lois Oliver of La Crosse; grandchildren Allan (Heidi) Wolfe, Timothy (Joni) Mellem, Arlen (Monica) Wolfe, Rebecca (Scott) Schroeder, Jessica (Adam) Johnson, and Stephanie (Troy) Johnson; great-grandchildren Gavin Mellem, Wyatt Wolfe, Ashton Staflien, Evan Wolfe, Camden Manning, Nick Schroeder, and Courtney (Gregg) Wobbenhorst and daughters. He is also survived by a sister Beth Hayter of Beloit, and many other family and friends. He was preceded in death by his parents; his wife Ruth; and his brothers Merlin, Clifford, Ivan, Orris, Arnold, and Paul Oliver; and a sister Erma Fuller, as well as other family and friends.